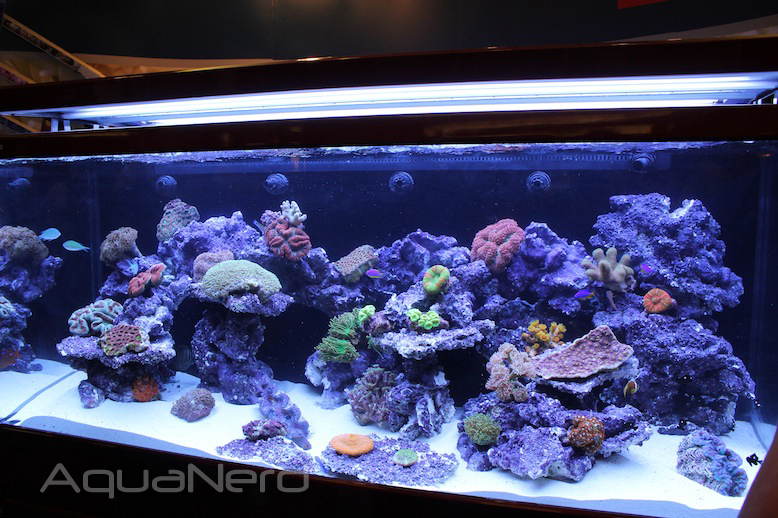 MACNA was full of gorgeous reef tanks, including several thriving lines of all-in-one aquariums. 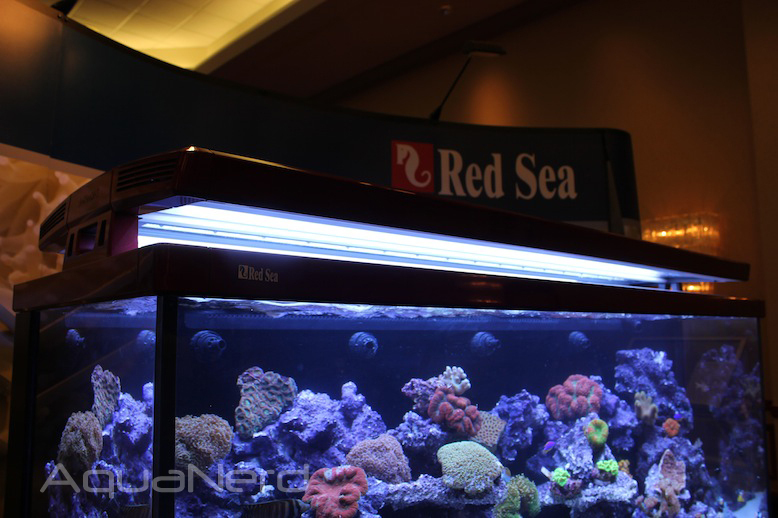 While most of the AIO tanks were of the nano variety, Red Sea went quite the opposite direction as they were showing off their massive MAX S 650, which was set up as one of the better looking reef aquariums at the show. 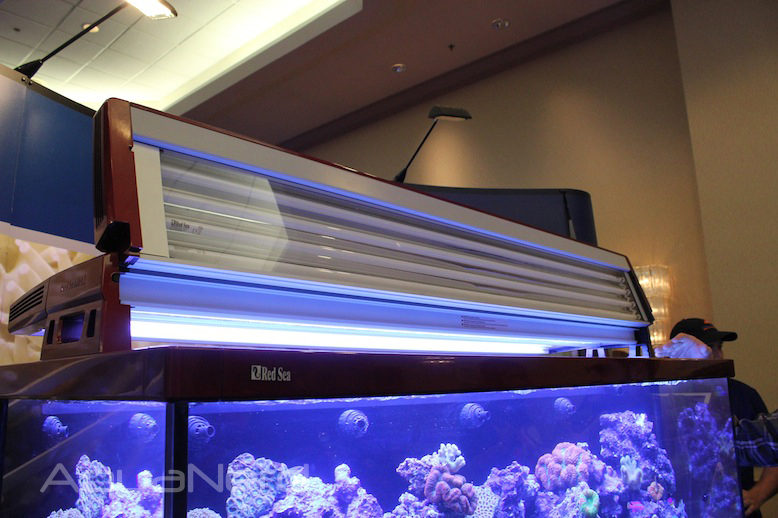 The feature rich plug-and-play bohemoth caught many looks with its Merlot metallic paint color and 10-bulb T5HO light system, and it only helped that the corals and fish looked great in their roomy environment. The Red Sea MAX S 650 is the largest tank in the lineup, and it sports a total system volume of 175-gallons (650 liters). 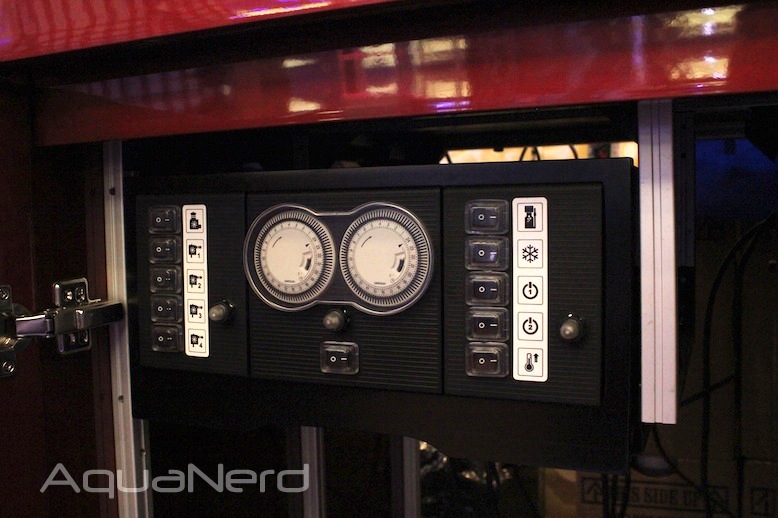 The display tank holds 150-gallons, with the other 25 coming from the sump and built-in filtration. The aquarium has a coast-to-coast overflow, and instead of a rear chamber packed with ceramic rings, sponges, and activated carbon, the MAX S 650 has a circulation pump chamber that moves a high volume of water without having all of the unsightly pumps inside the display area. Four pumps churning out 2000 l/h each make up the supplied water circulation system. 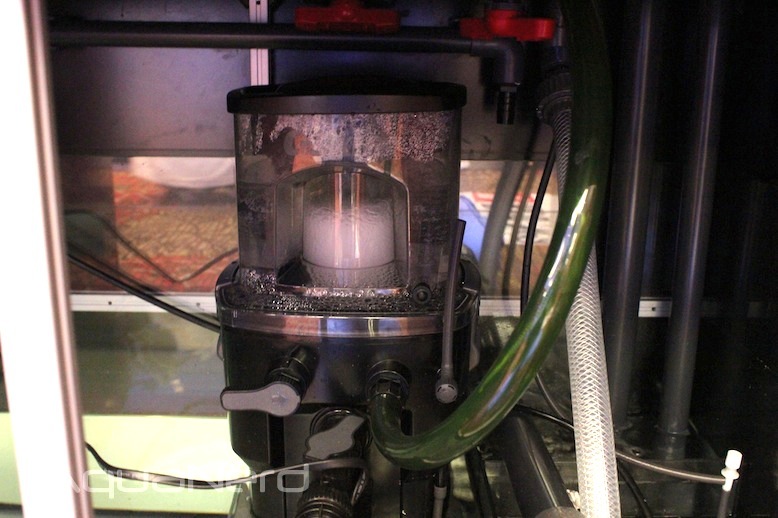 The filtration system, which is composed of a Red Sea C-Skim 1800 protein skimmer, integrated water top up system, sponge filters, and 600g of activated carbon, is all located in a glass sump in the aquarium stand. Additional plumbing has been supplied so that end users can easily add more filtration or even a chiller. Illuminating the huge display during the day is a set of ten 80watt T5HO bulbs which are evenly split across 10000K and actinic bulbs. At night, a set of LEDs cast a faint blue glow over the reef. The biggest feature of the lighting system, in our opinions, is the auto turn-off feature of the T5HO. Whenever an aquarium keeper wants to get into the tank, the front panel of T5 bulbs turns off as soon as the panel is lifted. This keeps the light out our eyes and prevents us from having to fiddle around with switches or timers. Speaking of timers, the MAX S 650 has an integrated power center that has 10 individually switched sockets for pumps and other accessories, along with a pair of analog timers that tell the main lighting when to turn off and on. 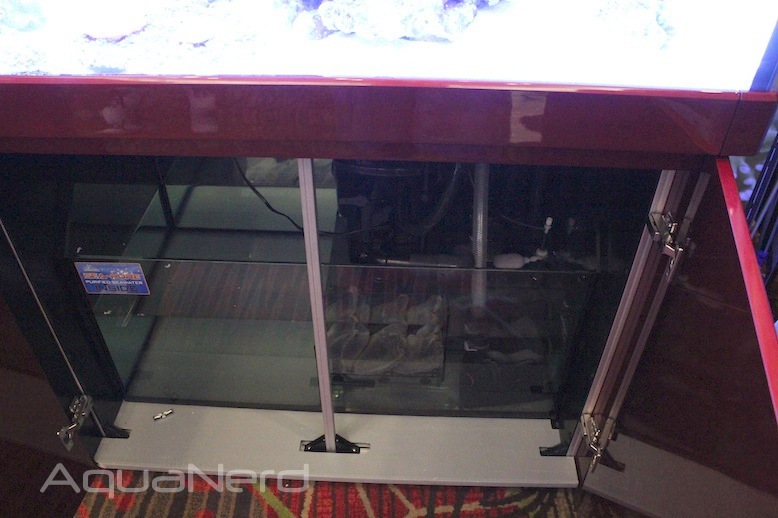 Holding the massive aquarium in place is a marine spec anodized aluminum stand. Covering this aluminum frame is a set of weatherproof polyeurethane painted MDF doors and panels, which renders the entire sump compartment is waterproof. The tank, stand, and lights combine for an overall dimension of 64″L x 28″W x 66″T. The price for the Red Sea Max S 650 is set at $4799.